Edinburgh has played a huge role in the history of Scotch Whisky. Leith was the city's whisky district, from where we can trace the origins of some of the biggest names in the industry. Leith has played a pivotal part in Scotland's whisky heritage. From the 16th century, it became a centre for the storage of wine and brandy, with as many as 100 bonded warehouses at its height. Whisky followed on when in 1822, Leith was granted one of only six licences issued to ports in Scotland allowing them to store whisky under bond. At the time, whisky was seen as a poor man’s drink, with wine and brandy the premium tipples. In the late 19th Century, the tables turned. The European wine industry was ravaged by a vine weevil called phylloxera, recently imported from the USA. Wine and brandy production crashed as producers fought to cure their vines of this pest. Whisky makers moved in to fill the void and the warehouses of Leith were soon filled with barrels of ageing spirit. 'The Vaults' in Leith, home to the wonderful Scotch Malt Whisky Society, was originally a wine warehouse dating back to the 18th century. Today, we associate whisky production with rural locations where production costs are lower and water plentiful, but at one time Edinburgh was as significant a place for production and blending as anywhere else in Scotland. Some of the biggest brands in the market today have their origins in the Scottish capital, including Johnnie Walker and Ballantines (the 3rd and 12th biggest selling brands in the world today respectively). Even the Scotch Whisky Association, which today governs and polices the provenance and regulations of ‘Scotch Whisky’, has its origins as 'The Edinburgh and Leith Wholesale and Spirit Association'. In Leith itself, Bonnington’s distillery (also known as The Leith Distillery) was founded by Mr Balenie and Mr Kemp in 1798 and then purchased by John Haig in 1804. Bonnington’s became a major grain distillery, and one of the first companies to use a Coffey still in 1835. The Haig Distillery merged with five other distilleries to form The Distillers Company. The Distillers Company was was acquired by Guinness & Co and renamed United Distillers. Both companies are now part of Diageo, an enormous company that owns scores of Scotch Whisky distilleries. Diageo has retained The Haig name for its Haig Club brand, a 100% grain whisky promoted by David Beckham around the world. 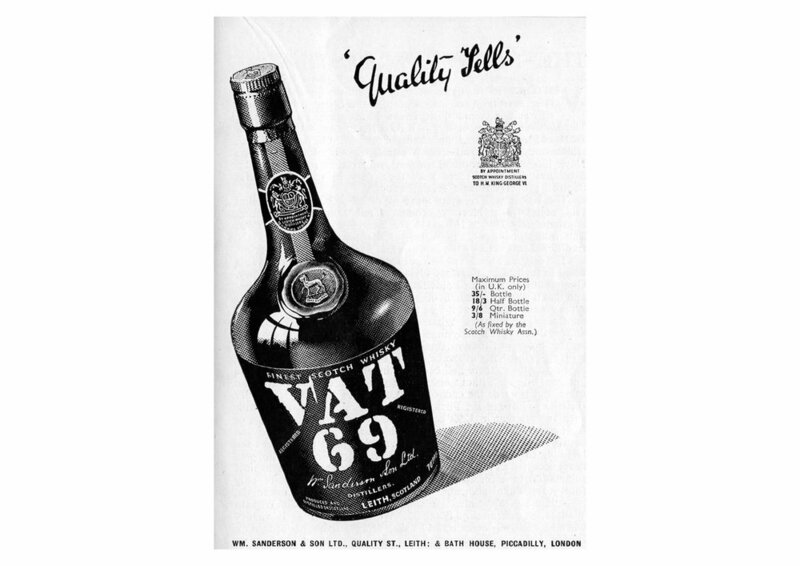 As a centre for storage, cooperage, and glass production, Leith became the hub for many blenders, the most famous of which was William Sanderson & Sons, whose VAT 69 brand lives on today. Sanderson would go on to co-found The North British Distillery, which still operates in Gorgie, producing whisky for brands including Johnnie Walker, Cutty Sark and Famous Grouse. One of Sanderson’s co-founders, Andrew Usher, would bequeath money to build Edinburgh’s famous concert venue, the Usher Hall, on Lothian Road. Lochend Distillery (also known as Yardheads and Leith Distillery) was founded on Yardhead Street by Alexander Law in 1825, who promptly went bust after just one year. It then passed through a series of owners before being acquired by the Bernard family in 1860 and trading as Bernard & Co. 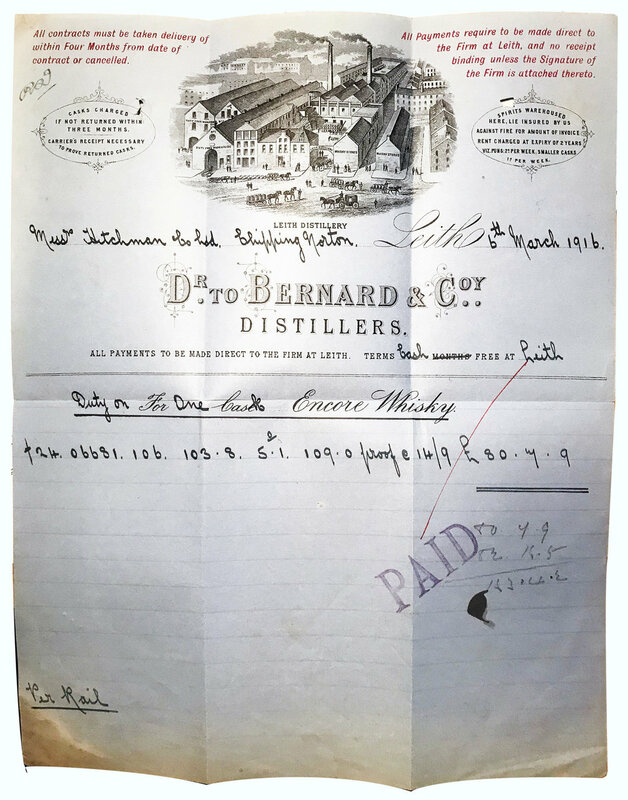 The distillery apparently ceased operations in 1884, although this invoice for Encore Whisky certainly refers to a Leith Distillery still operating in 1916. Also at Yardheads is the former bonded warehouse of John Crabbies and Co. Now best known for its green ginger wine, at one time they produced a range of malt and blended Scotch Whisky. The green ginger wine was still made in Leith until the 1980s. Crabbie & Co was purchased by another Leith blender, MacDonald and Muir. Macdonald & Muir of Leith, a wine and spirits merchant founded in 1893, produced two more brands famously associated with Leith: Bailie Nichol Jarvie and Highland Queen, the latter a celebration of Mary, Queen of Scot’s arrival in Leith in 1561. MacDonald and Muir went on to acquire the Glenmorangie whisky company in 1918 (adopting the Glenmorangie name in the process), and their offices are still located in Edinburgh today, while the company is now owned by the French luxury goods giant, LVMH. The Pattison Whisky Co was founded in Leith by Walter Pattison in 1846, and then taken over by his sons Walter and Robert Pattison in 1881, who later renamed it 'Pattison's Ltd'. They sought to capitalise on the collapse of wine production on the continent, and the subsequent whisky boom that followed. The company grew quickly, attracting scores of private investors and acquiring stakes in several distilleries in the process. However extravagant spending and financial mismanagement brought the company crashing down as quickly as it had risen, and it folded with huge loses to investors in 1898. You can read a full account of this unhappy story here. Thanks to Spirit of Leithers for the pictures.